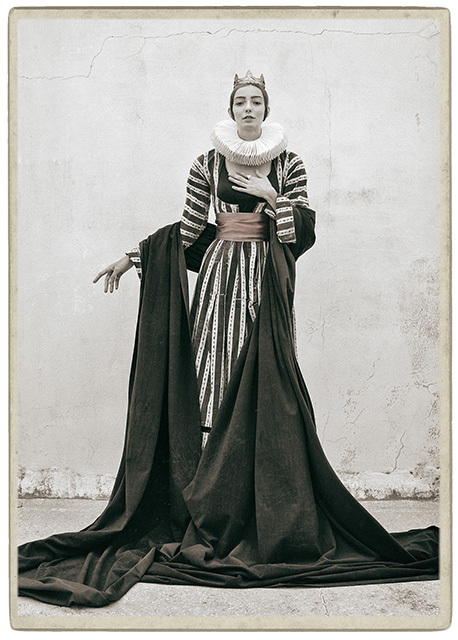 A series of photographs inspired by tarot cards. Roles – Symbols firmly rooted in a society, which considers the hierarchy of people according to their identities and qualities as well as their superficial, one-dimensional nature as the absolute truth, essentially thereby ignoring their inner identification. The entirety of this venture is barely a simple photographic process; instead, it could be characterized as an overall performance. I personally sew and work on the clothes and other objects used and presented. I do not work with professional models; rather I prefer working with everyday and ordinary people. In my attempt to depict the most suitable individual based on their personality traits as well as their experiences, I get to know them personally prior to the photo shooting. Their roles are not random. On the contrary my models’ roles derive from their expectations and feelings. The portraits created mean much more than what is comprehended at a first glance, as it is the case with tarot cards as well. Arcana comprises Major, part of which is presented here and consists of 22 photographs and Minor that consists of another 56 photographs. My aesthetic approach – since it is about cards – has been intimately connected with the aesthetics of the albumen prints and the Cabinet Cards, widely spread since the middle of 19th century.